Sit quietly after an exercise session and close your eyes. Notice how you feel: you might feel clean or as if you�ve grown two inches. Does your skin seem flushed with health? Do your spine or fingertips tingle with energy? Memorize the sensations. When you next doubt you have time to exercise, sit quietly, close your eyes and bring yourself back to this exquisite feeling. After water exercise, relax completely by floating. Lie back, immersing the back of your head in the water, and let everything go. Widen your limbs to form a star, bring the soles of your feet together or stretch arms and legs away. Slow the inhalation to fill every part of your lungs and help you float. Let go, trusting the water and your breath. At the end of a session, lie on your back on a rug or mat with palms facing upward. Your face should be comfortably parallel to the floor; if it isn�t, place a small cushion beneath your head. Check through your body to see if you are tense anywhere. It is usually helpful to take the legs and arms wider apart until you feel the joints and muscles release. Let go of your jaw and mouth, and feel as if your face is without expression as the skin softens. Relax your eyelids and look inside yourself. Breathe into that inner space and let any thoughts drift through your mind without catching hold of them. Rest here for 10�20 minutes. Keeping your wrists and ankles mobile as the decades pass means movements of the hands and feet remain easy, and independent life becomes more likely into old age. You can perform exercises to help maintain mobility at your desk or in the car as well as in the exercise studio. Keep a small rubber ball on your desk or beside the bed. Squeeze it in your palm for up to a minute twice a day to exercise your hands. 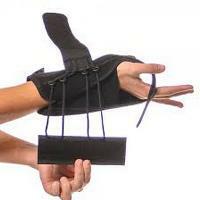 Using the palm of one hand, gently press the back of the fingers of the other hand toward the inner arm and hold. Opening the palm, draw the fingers back, trying to take them toward the forearm. Repeat with the thumb. Repeat on the other hand. Place your palms together in front of your chest, thumbs touching your sternum. Bring them down until you feel a stretch behind the wrist and can no longer keep the palms pressed together. Work to keep the finger pairs lengthening upward and the palms touching. Start by kneeling, then tuck the toes of your right foot under. Step forward with your left foot and gradually take your bottom toward your right heel, increasing the stretch on the back toes. Repeat on the other side. Try this for stiff, tired feet, but if you find this exercise uncomfortable, exert pressure very gently. Remove your shoes and socks. Look at your toes. Lift them and try to stretch each digit away from its neighbors. Aim for a gap between each toe. It can help to spread the fingers wide as you practice. Stand with feet parallel and hipwidth apart. Spread your toes. Close your eyes if you want to. Imagine the soles of your feet sinking slightly into soft earth and growing roots. Now feel whether there is equal weight on both feet. Do you have more weight on the heels or the toes? (For a clue look at the heels of your shoes.) Visualize your stance like a mountain, broad and strong. Breathe.